NAPA, Calif. (AP) — Because he isn’t likely to play more than a series or two in Friday’s preseason opener, Detroit quarterback Matt Stafford has a few modest goals for the Lions offense. The Lions spent the past two days conducting joint workouts with Oakland at the Raiders’ training camp facilities in the heart of Napa Valley wine country. Following Tuesday’s 2 1/2-hour practice, which was highlighted by a multi-player brawl that ended a team scrimmage session, the Lions packed up to travel to a hotel 75 miles south of Napa where they’ll stay until Friday’s game. Detroit first-year coach Matt Patricia declined to say how much Stafford and the rest of the Lions starters will play. The Lions’ first offense had an uneven day against the Raiders during the team scrimmage. They were flagged for three penalties and sputtered on their initial drive before Stafford found wide receivers Kenny Golladay and Marvin Jones Jr. for deep completions. Stafford passed for 4,446 yards with 29 touchdowns and 10 interceptions in 2017, his seventh consecutive season with 4,200 yards or more. The 30-year-old quarterback also had a career-best 99.3 passer rating. Detroit, which hasn’t made it past the wild card round of the playoffs since 1991, won three of its final four games down the stretch but failed to advance to the postseason. 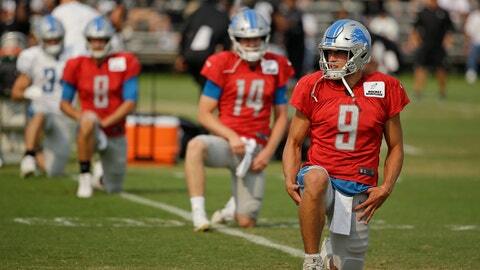 Although he won’t be on the field very long Friday, Stafford is relishing playing in a game after mostly practicing against Detroit’s defense before the two workouts with Oakland. Tuesday’s practice got chippy when Lions defensive end Anthony Zettel hit Raiders backup guard Jon Feliciano from the side, sparking a fracas involving multiple players before they were eventually pulled apart.